Playing blackjack for real money on the Internet has become a popular pastime for many card game enthusiasts, with multiple game variants and formats available at our recommended online casinos. We take a look at the difference between live dealer blackjack games and random number generator blackjack games to determine which variants of 21 provides the best option for Aussie players. Live dealer casino games have become all the rage amongst online players. These are games hosted by real people from real casino studios, with all the action streamed directly to your computer or mobile via a live video feed in real time. 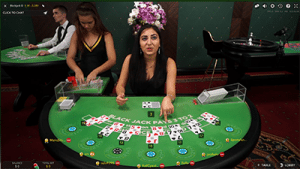 Live dealer blackjack games are hosted by professionally trained croupiers who are just as immaculately presented and knowledgeable as those you’d play against in a land based casino. You get to place your bets and watch as the cards are dealt before your very eyes, playing directly against a real human dealer as you would in real life. Live dealer games provide the antidote for punters who miss the social, interactive elements of playing in a land based casino, while providing a trustworthy alternative for those who are wary about random number generators. What is random number generator 21? Random number generated (RNG) blackjack games are the most common form of 21 you’ll find when playing at an online casino. Under the surface of these computerised games lies the complex RNG software, which acts like the beating heart of the blackjack game. Random number generators are powered by intricate mathematic algorithms, providing unbiased blackjack results uninfluenced by any external factors, in the similar way shuffled cards provide random results. You don’t have to understand the complex technology allowing an RNG to function, all you need to know is the RNG blackjack games at our recommended casinos are all 100% legit and certified by external testing agencies like eCOGRA to ensure true unbiased results for every blackjack hand. Which blackjack format is better? In both formats of blackjack, the aim of the game is the same: To get a hand as close to 21 as possible without going bust, while having a better hand than the dealer. 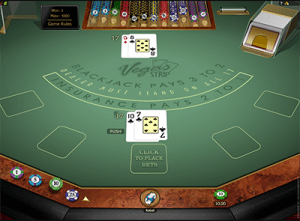 Different blackjack software may offer different features and layouts, but general game play is the same no matter which version you choose. Therefore, whether you prefer live dealer 21 or RNG blackjack comes down entirely to personal preferences. If you’re just starting out playing blackjack online, you might want to consider the factors below before deciding which blackjack format is right for you. Games are hosted by real human dealers from real land based casinos or high-end studios set up to replicate sophisticated casinos, providing the ambience and atmosphere to replicate the real life blackjack experience. Cards are shuffled and dealt in front of you, so you know you can trust the results are unbiased and uninfluenced by the casino in any way. You have the option of chatting with other players, which is great for those who prefer the social elements of blackjack. Given the data required to power these live video feeds, you will need access to a fast, reliable Internet connection in order to avoid any lost connections or screen freezes. If you don’t have a solid, high-speed Internet connection, live dealer blackjack may become more frustrating than it is fun. Unlike RNG blackjack games which can be sampled for free in practice mode, live dealer blackjack games require real money bets in order to play, so you’ll need to constantly fund your bankroll in order to access live titles. Live dealer blackjack variants are limited, and while there are some unique live 21 games like Blackjack Party starting to emerge, most live dealer games play on classic blackjack rules with not much variation between software providers. You’ll find a huge range of RNG blackjack games to choose from online, allowing you to try many different game variations, like American Blackjack, Double Exposure Blackjack, Vegas Strip Blackjack, Atlantic City Blackjack, Spanish 21, Pontoon, Pirate 21 and many more. RNG games can be played for free in practice mode, so you can try out as many games as you like, familiarising yourself with the rules and scratching up on your strategies before playing for real money. Although our recommended blackjack sites only use certified RNG software, many players remain sceptical about computer generated results, which is where live dealer blackjack offers a reliable alternative. Our recommended online casinos all offer at least one or two RNG blackjack variants at their mobile casinos, allowing you to play real money 21 on the go from your smartphone or tablet anywhere you can secure a Wi-Fi, 3G or 4G connection. As you can see, both live dealer and random number generated blackjack games have their benefits and drawbacks. The best way to know which format is right for you is to visit one of our recommended, reputable casinos and sign up for an account to give both types a try to see which is more up your alley. Playing online means you also have the choice of constantly changing between both formats, so you can enjoy the best of both worlds. Sign up for an account at G’day Casino to play both live dealer blackjack and random number generator blackjack for real money bets directly over your Web browser. New players receive 50 free spins upon sign up, plus a 100% matched deposit bonus when transferring cash to play with for the first time.